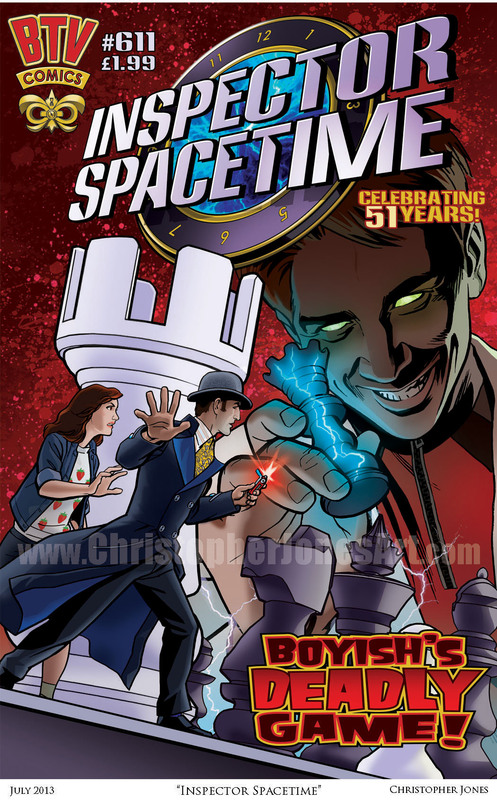 This Inspector Spacetime Comic Book Print could be yours! This faux comic book cover will be available as an 8.5×11″ or an 11×17″print to supporters of the Untitled Web Series Season 2 Kickstarter. Travis Richey just revealed the full color print I created in support of his Kickstarter campaign to fund Season 2 of Untitled Web Series about a Space Traveller who Also Travels Through Time. It features Travis Richey’s Inspector with Piper Tate (Carrie Keranen) at his side, facing off against the looming evil of Boyish the Extraordinary (Eric Loya). You can get one of these by helping fund the Series 2 Kickstarter. Read the Pledge section for more details. Learn more about The Inspector and watch Season 1 of Untitled Web Series online for free! Guest stars will include Mayim Bialik (Blossom, Big Bang Theory), Robert Picardo (Star Trek: Voyager) and Chase Masterson (Star Trek: Deep Space Nine). Watch the Season 2 Prequel Episode trailer and then please help make The Inspector’s Second Season the biggest and best it can be! Misc Artwork | Christopher Jones | July 17, 2013 9:25 pm | Comments Off on This Inspector Spacetime Comic Book Print could be yours!